Rockville Rewards is a discount card sold for $25 by area nonprofits valid for 1 year of discounts at Rockville area businesses. Stepping Stones is selling them again this year; 100% of the profits go toward Stepping Stones programs to help homeless and former homeless families in our community move towards stable housing. Rockville Rewards is a win-win for everyone. The discounts pay for the card after only a few uses—you get discounts at restaurants, retail stores, health and beauty and other services and sports and fitness activities. And purchasing the cards helps homeless families in the community move toward more stable housing. Discounts are good from September 1, 2015 to August 31, 2016. 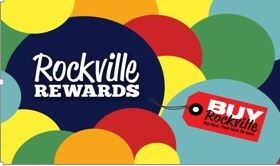 If you would like to see which businesses are participating and what deals are being offered, go towww.rockvillerewards.com. Do you want a deal on this deal? September 9, 2015 is Rockville Rewards Kick-off Day, and on that day only we can sell Rockville Rewards cards for only $15 each! Look for us at Spice Xing restaurant in Rockville Town Center. Or buy it on our website that day.